Wild Souls Picks: 2015 Grammy Red Carpet! 13. Bonnie Mckee: Love the dark purple dress with matching lip! 12. Anna Kendrick – I love that Anna went a little gutsy on The Red Carpet and sported a plunging tux. 11. Beyonce in Proenza Schouler: Beyonce stunned on The Red Carpet as per usual, but it felt a little “safe” for her. 10. Rihanna in Giambattista Valli: I know she has gotten some flack about her confection of a gown, but I love a risk on The Red Carpet and Rihanna can work pretty much anything. 9. Since these three dresses were so similar (but still fabulous) I couldn’t choose one over the other, so I gave them a three-way tie in the #9 spot: Jessie J in Ralph & Russso, Kat Graham in Yanina Couture, and Meghan Trainor in Galia Lahav. 8. Miranda Lambert in Gabriela Cadena: My girl, Miranda, looked svelt and fabulous in her black gown with magenta straps and cut-outs at the waist. Love the dress Miranda, but we are DYING to see you with an updo. 7. Katy Perry in Zuhair Murad: Katy sparkled on The Red Capret in a dress bedecked in dangling jewels. I love how her lavender hair added a bit of funk to an incredibly glamorous gown. 6. Iggy Azalea in Armani: I really loved Iggy’s gown and I really respect that she wore a statement updo when she has such a strong face. Most women wouldn’t have the confidence, but I love how she owns it. 5. Jhene Aiko in Alberta Ferretti: I love this overall look! The dress is soft and feminine while her hair and makeup is kind of sultry. Definitely one of the most unique gowns at The Grammys this year. 4. Lena Hall: I cannot get over this smokey grey gown! It is BEAUTIFUL – a classic silhouette in a modern color. Against Lena’s pale skin and dark hair the color simply stuns! Team it with her natural lip color and just-a-little-smokey eye and you’ve got one of the best H2T looks of the evening. 3. 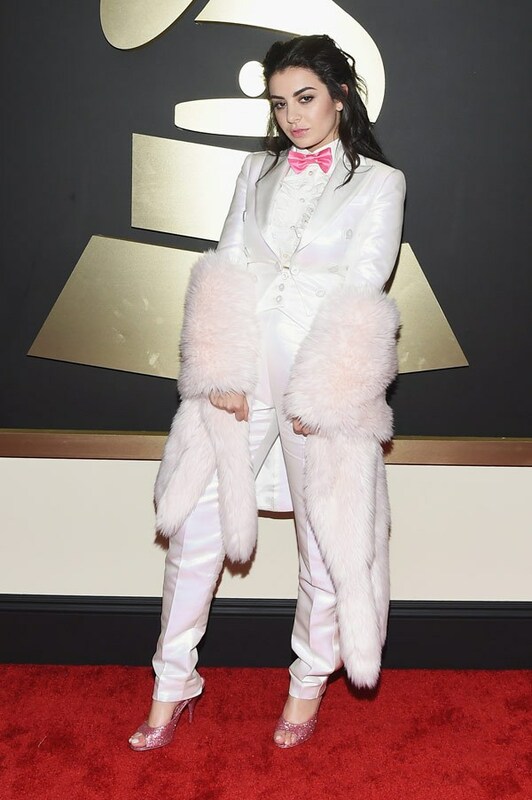 Charli XCX in Moschino: Of course there are going to be some people that hate on this tux, but I’m not one of them. I believe you have to factor in the personality of who is wearing the look, and for Charli XCX this ensemble makes a lot of sense. 2. Chrissy Teigen in Emilio Pucci: Chrissy, Chrissy… how much do I love thee? Let me count the ways 😉 Chrissy NEVER disappoints on The Red Carpet. She somehow always manages to pull off something unique while remaining true to herself. 1. Taylor Swift in Elie Saab: As far as I’m concerned, Taylor won The Red Carpet this time… That gown was amazing and totally Taylor! LOVE the teal ombre with a little sparkle AND that pop of purple from her Giuseppe Zanotti Heels. It’s the first time she has worn her hair down since her 2008 Grammy Award appearance and I felt it was the right choice with her short cut that EVERYONE is talking about. Go get it Miss Swift! You looked stunning!